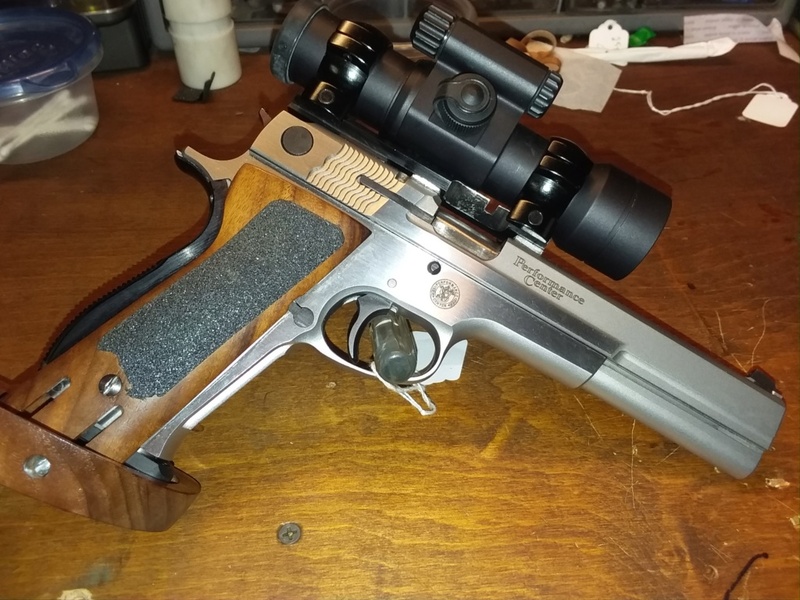 I would like to hear from shooters who shoot bullseye with S&W 952. Their experience with the gun , loads , accuracy results etc. Also , how does 952-2 compares to : Custom Beretta 92? 1911 in 9mm. PS. I would only be using iron sights with either gun. If you own a 952 go for it, If your hands are big enough for a 92 and you like the swing trigger go for it. If you're a 1911 fan go 1911 9mm. I owned both. I could never get the 92 to feel right in my hand. I still own and regularly shoot the 952-2. I have some nice loads worked up for it. The pistol is way more accurate then I am. After market grips are hard to find but magazines are easy. Len. I converted 1911 grips to fit this one. I find Sam's Beretta VERY accurate. But I find Beretta not forgiving. Especially at 50 yards. Any slight mistake , and I am in the 6 ring. 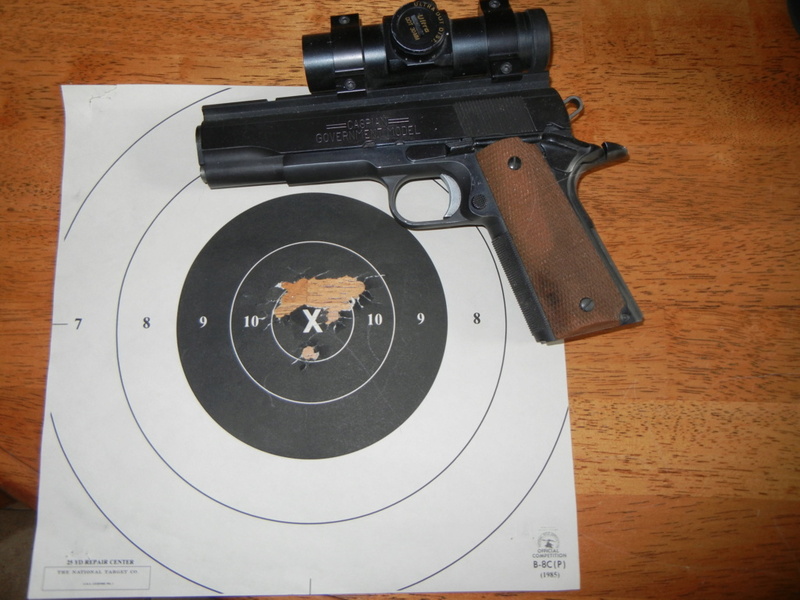 Compared to my Kidd Beretta or my custom 1911in 9mm, the two PPC9's I had were nowhere near as accurate. Basically the barrel to slide fit was like a rat turd inside a guitar case. No 9mm is forgiving, if your shot isn't perfect, the result will be way out. My advice to you is if you want to learn how to shoot that Beretta well is buy an air pistol. Not an Olympic level model but something with a heavy trigger. 30 shots a day. Learn how to eliminate flyers, then hold black, then mostly nine ring. robert84010 wrote: Compared to my Kidd Beretta or my custom 1911in 9mm, the two PPC9's I had were nowhere near as accurate. Basically the barrel to slide fit was like a rat turd inside a guitar case. No 9mm is forgiving, if your shot isn't perfect, the result will be way out. Wow! I though PPC 9's were supposed to be more accurate than 952-2's . My 952-2 holds ten ring at 25 for 10 shots off the bench with my duty ammo without a problem. I always wanted PPC9 . About 9mm not being forgiving , I totally agree. Somehow any decent 1911 with 185SWC match ammo is just easier to hit with . I'VE OWNED ALL THAT YOU TALKED ABOUT. AN OVERVIEW IS BELOW. I STARTED WITH THE PPC9'S. SHOT THEM FOR SEVERAL YEARS IN PPC. GOOD SHOOTERS, ACCURATE, DEPENDABLE, IT TOOK YEARS OF HEAVY SHOOTING FOR THEM TO OPEN UP. I MEAN APP 20K RDS A YEARS FOR ABOUT 5 YEARS. THAN IT ONLY NEEDED TO HAVE THE BUSHING REPLACED AND IT WAS LIKE NEW. EASY TO SHOOT. BUT FROM THE S&W GUYS AT THE NPSC THERE ARE NO REPAIR PARTS AVAILABLE ANYMORE. I HAVE OWNED 3 DIFFERENT BERETTA'S. 2 SAMS , 1 BALL, 1 FULL WADGUN WITH SCOPE MOUNT AND COMP. SHOT SOME GOOD SCORES, BUT NEVER ABLE TO TOP THE 1911'S . 1 KIDD HARDBALL GUN. A WORK OF ART. DUMPED THE SAMS , I STILL HAVE THE KIDD BERETTA. THE 1911 ROCK RIVER'S IN 9MM I HAVE OUTSHOOT THEM ALL. I HAVE 4, 3 PPC AND 1 WADGUN. BOTH IN 1-16 TWIST AND 1-32 TWIST. THAT BEING SAID I HAVE RANSOM TESTED PROBABLY 6 BERETTA'S AND ABOUT A DOZEN 1911 9MM'S AND A BUNCH OF PPC 9'S. FROM THE TESTING I HAVE FOUND THE FOLLOWING. THE BEST PPC 9'S WERE 1.5" WIDE BY 2" TALL AT 50YDS. ALL OF THEM VERTICALLY STRUNG, NONE WERE WORSE THAT 2" WIDE BY 3" TALL ( THAT'S X-RING ON A NRA B27 TARGET). THE BERETTA'S DID HOLD AN 1.5" AT 50YDS. BUT WITH THE GRIP SIZE AND TRIGGER MY SHORT LINE DID SUFFER. I HAD TO WORK MUCH HARDER TO GET GOOD SCORES . That's great info. THANK YOU. So basically a 1911 9mm is a better choice. In Your opinion , how would a top of the Beretta compare to 952? Overall , not just ransom rest accuracy. That is what I thought. Now the tough one. How do You compare 952-2. and 1911 9mm ? For 50 and 25 yard match shooting. I shot better scores with a Beretta compared to the PPC9. My assumption about the PPC9 is it not built for the ultimate in accuracy but for 100% reliability and decent 50 yd. accuracy since PPC does not allow alibies. If they wanted to ensure 50 yard accuracy they would have shot the test target at 50yd instead of 25yd. My 1911 has a much lighter trigger and a Bomar rib so it's not really a fair comparison but it is the most accurate centerfire pistol I own, by far. The fit on it makes the PPC9 look like a Glock. Ok. I keep hearing that S&W PC pistols are not fitted well. My 952-2 had a superb fit. Accurate and works everytime Did I just get lucky ? Also . Without an access to ransom rest , what do we consider as being ACCURATE ? What I am saying is that a custom hand fitted 1911 by my gunsmith is a better made pistol, not that all custom shop S&W pistols are poorly fitted. I am talking a small sample size here. I have complete confidence that your pistol or my PPC9 shot well enough to go Distinguished. I think that is your goal here? As far what is considered accurate without a rest. All I know is that when I call a good shot with my 9mm, and this is far from every shot, but when I call a good shot it is an X everytime. There will be X's on top of each other not scattered around the 10 ring. This is more so at 25 yards but I have had that happen at 50 from my hand. A custom pistol leaves no doubt why shots are not X's.